These are two of my favorites from my collection of family pictures. 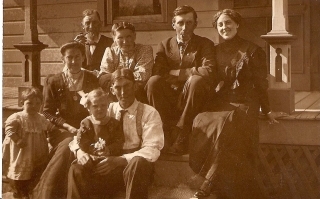 The first picture was taken on the porch of the Brockhaus family farm nearl Campbellsport, Wisconsin in about 1913. Seated from left to right in the back row are my Great Great Grandparents William and Pauline Brockhaus, their son-in-law Oscar Schwinge and their daughter Hilda. 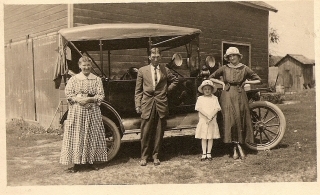 In front are my great aunt Grace Waege, my Great Grandmother Ida, my grandmother Alice (Waege) Rathkamp and Emil Brockhaus. I’m pretty sure my Great Grandfather, Bill Waege took this picture. I’m not sure exactly why this is a favorite of mine, but I could spend hours looking at it. The next picture includes Pauline and her son Emil Brockhaus. I still haven’t identified the little girl or the woman, but I assume they are Emil’s daughter and wife. The body language in this picture needs no translation. I have very little information on Emil, but I do know he died in 1946 and is buried next to his parents in the Hustisford Cemetery. In the 1920 census, Emil shows up twice. First as a farm hand in Oak Grove, Wisconsin and next living with his parents in Hustisford, Wisconsin. Both entries list him being divorced. Go figure. I just wanted to tell you what a wonderful story you have shared! I ran across it while doing reseach on another family from Hustisford. I do reseach for Dodge/Jefferson Counties Genealogical Society in Watertown WI. If you ever need more information, either contact me or the Society. We will be glad to help. Great job!